Get Your Custom Wheels and Tires repaired or replaced from the City's Largest Wholesaler to the trade. NOW SELLING Direct to the Public. Stop by or call and see how we take care of you! Continue reading "Rim and Tire Gallery from our Customers I Las Vegas"
Continue reading "Las Vegas Best Tire Coupons and Wheel Deals"
Continue reading "Rim Repair For Audi, don't tell your dealer! I Las Vegas"
Now You can be featured on your very own internet auto page and get customer feedback! 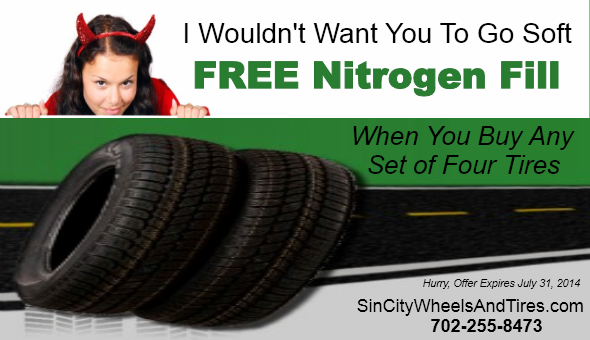 Sin City Wheels And Tires is adding a very personalized newsletter to their website. Customers who have purchased rims or had custom wheels made can now photo and feature their car in the newsletter and website. Our loyal customers can even make comments and rate the photos! Its like getting your own magazine page on the internet. If you've had new wheels put on your car or just want to see what looks good on other autos, then stop by our homepage and subscribe to our new newsletter. Continue reading "Sign Up for our Newsletter"
Hotel Employees and Culinary Workers in Las Vegas can now receive 10% off their total repair or replacement invoice says Steve, owner of Sin City Wheels and Tires on Simmons Road in North Las Vegas. It's simple to do, just show your work card and tell us what you want. We've always listened to our customers and with our selection, low prices and quality workmanship we over deliver. The only drawback, you'll have to eventually pick the tires or wheels that fit your personality from our massive selection. 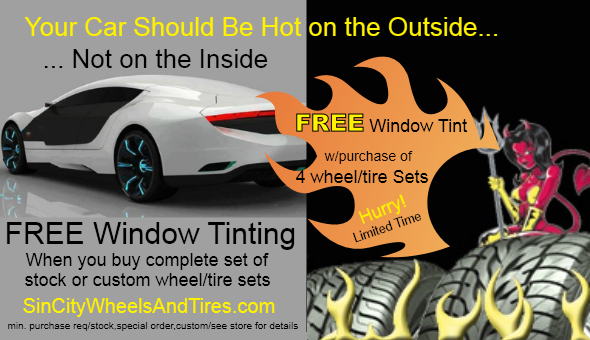 Continue reading "FREE Nitrogen Fill with Purchase of 4 Tires"
Continue reading "free window tinting when you buy wheels & tires"
We can take care of your custom wheel repair or replacement today! Continue reading "We can take care of your custom wheel repair or replacement today!"